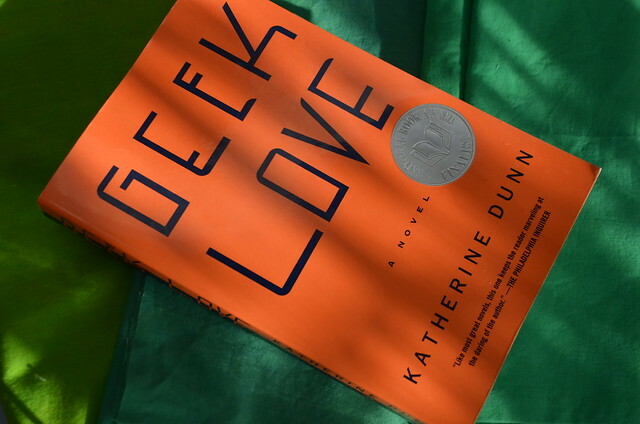 I joined a book club and last month we read Geek Love by Katherine Dunn . It's about a carny family of freaks. Among other things it involves a cult in which converts choose to cut off parts of their bodies one joint at a time --starting with the digits of fingers and toes, moving to arms and legs until they are left helpless on their bellies with nothing but a torso and head. Yes it's gross but after all its a tale of envy, jealousy, shame, greed and the desire for normalcy. The author's metaphor asks us to reflect on the ways we choose to become helpless when we deny the parts of ourselves and our lives that we don't like or can't accept. Some of the people in my book club didn't like this late 80's novel, but if you have an adventurous imagination you might enjoy the read. The book is filled with descriptions of green. I was surprised that no one else in the book club noticed this. I'm more of a visual reader than I realized. Her gums are knobby and a faintly iridescent green. I get an instant glimpse of her long legs, sometimes flashing bare through the slits in her startling green kimono. The rotten edge of the sky was moldering into arsenic green when the light of the tent went out. I nod my head at her pale green face. They came out of his eyes as a green liquid that dripped to the ground making puddles. He had a room of his own and three sets of green pajamas. Around the same time I was reading Geek Love I had another visit with Eli Leon. His entire house is bathed in green. He has green curtains in his living room window. 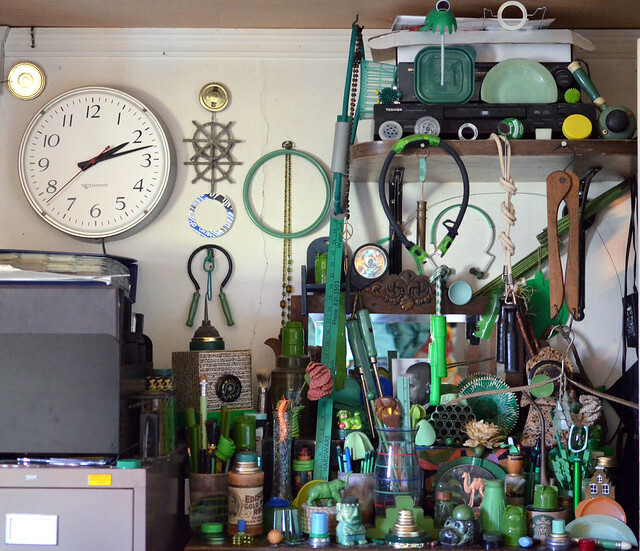 He has collections of green rags, vacuums, and vintage trinkets, toys, and tools of all sorts arranged in beautiful, fantastic tableaus throughout his house. I asked Eli if green was his favorite color and a smile lighted his face when he said yes. I told him that green was my favorite color too. How about you? What is the emotional range of your favorite colors? Or add your favorite GREEN photo. I just installed a new plugin that allows you to submit a photo with your comment!